Delicious General Tso’s Tofu. Vegan and delicious !! 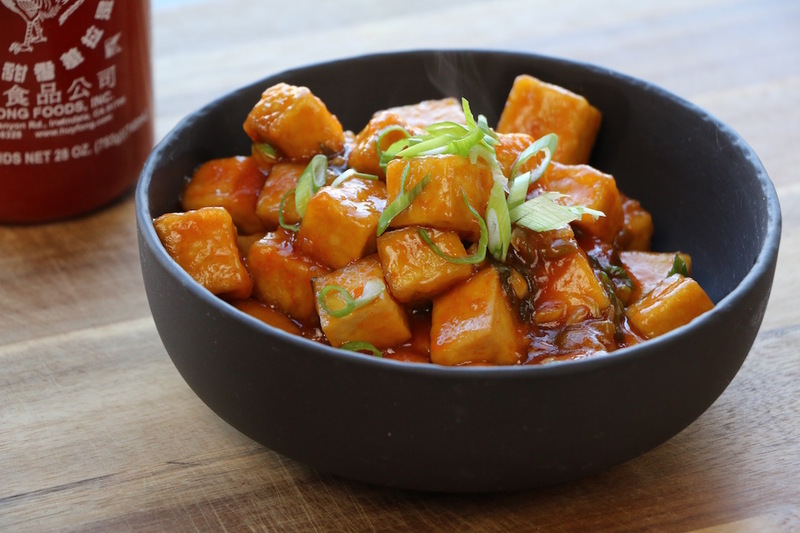 Cut tofu into cubes and coat well with cornstarch. In a saucepan heat the oil. Add tofu and cook until they are golden brown and crispy. Add oil if necessary. Stir in garlic, ginger, maple syrup, soy sauce, ketchup, Sriracha sauce, scallions and vegetable broth. Let it cook until it thickens. If it gets too thick, add some water. This little miracle combination of ingredients that makes up the sauce is golden! I am putting this on everything I make. Even my meat eating family members liked this recipe. But I just love the sauce ingredients. Thanks so much! made this for lunch yesterday and OMG so yummy!! Love it!! The General Tso’s Tofu is seriously so delicious! My husband and i made a batch and finished it in 2 hours! We’re going to make a double batch today and we’re hoping it will last more than 1 day ???? Love this recipe <3 nice Blog! My husband loved it! I coated the tofu with cornstarch but most of it stuck to the pan otherwise this was an easy and delicious recipe. I stuffed the tofu in between yummy hamburger buns with raw red onions and spinach to make a handy lunch. This is excellent! We loved every bite. So easy and the sauce is delish! It will be a regular for us. I loved this recipe. Made it today. I was so anxious to try it. Loved the way the flavors messed together. Very tasty !! Thank you. It was so thrilling to finally find an easy General Taos recipe with the perfect balance of flavor and heat. This was my lunch, dinner and evening snack yesterday… straight up … no rice or other accompanying food. Making it again today with a little extra sauce over shredded lightly steamed veggies. Great recipe loved it overall, but was too salty for me and my family. Gonna cut back on the soy sauce and broth next time, or use a no-salt broth (and probably still less soy sauce). Fantastic though, great video with great instructions. Made it a no-brainer! Very nice, easy to make, and delightful to eat. This is amazing I make it almost each weekend. My husband hate tofu but each time I make this dish he eats half of it :). Thank you for sharing this amazing yummy dish!!!! This recipe was so flavourful and yummy. I was too lazy to cook rice, so I ate it with some rice noodles. I probably can eat it this dish every single day ???? This is a weekly staple dish at our house now. This is better than takeaway tofu. So delicious. Thank you! Didn’t know what to make for Lunch and saw I still had some tofu left. I remembered this recipe and made it for Lunch. This was SO yummy I shared with my 1 year old and he loved it! I paired it with frozen Veggies and white rice and it was GREAT! Thank you so much for these fast and healthy recipes as I don’t always know what to cook for myself as I don’t always want what my family of 7 is eating. Will be trying many more of your recipes and look forward to whats next on your menu! Made your General Tso Tofu this evening. Excellent! …and my teen boys who sometimes are skeptical of my efforts to get them to like and eat vegan more often….loved it too. Loved it! This has always been my favorite dish at veggie restaurants, but I never thought I would be able to make it. I added a little extra maple syrup and skipped the garlic, and it was still so good. I made 4 Th times. Still hửngry for . LOVE and thanks so much . It’s not your fault, some brands advertise firm or even extra-firm tofu and it’s in fact soft tofu. 🙁 Firm tofu should have a cheddar like texture, it should be very firm. I’ve suggested this recipe to all the people that have doubts about tofu, and also posted it to Pinterest ( with credit!) It’s magic; I love it. Thank you very much Sally !! Second time making this…deeelish! I served it over brown rice…these easy recipes make being a vegan heavenly! Thanks! thanks very much…..I did it today the recipe and I’m waiting the guest …. I made this for Sunday dinner and it was delicious. Called my Son to tell him that they should try this. They love tofu. Will make again. Thank you so much. I’m planning to make Pad Thai next. This is delicious. I am a seasoned vegan cook and this has become our comfort food dish. YUM! Very awesome!!! Thank you! I loved it with the tofu (and my non-vegetarian hubby enjoyed the sauce in a chicken version). I saw that some of the commenters were bothered by mushy tofu. I always toss tofu into the freezer when I buy it, and when I’m ready to use it I thaw it out and then give it a good squish between a couple of plates to get rid of most of the water (I learned the trick from a cookbook a few years back) – I find that this treatment makes for an extra-extra firm texture. 🙂 I’m enjoying your web site, and I’ll definitely try more of your recipes! I made this today and shared it with a friend who loves General Tso’s chicken and doesn’t like tofu. Well. he loves your version and asked for a batch for himself. thank you! Easy to prepare and delicious. I will no longer buy General Tso’s Tofu for takeout! I made this last night. So easy. Most enjoyable. My daughter tried this recipe, loved it. So glad we found your site … and best of all … every one of the comments were from people who had tried it before they commented .. and … no one tried to put their own spin on it and change the recipe. It’s a keeper! What should we do in that case? I tried this recipe and this is the first time I have done anything with tofu. Love the sauce but my tofu was soft even though I bought extra firm. Any tips for a beginner when it comes to tofu? This and the tofu with peanut sauce are amazing, and I’m looking forward to making more of your recipes. They’re so simple to follow and most of the ingredients are things I already have on hand. Question: Why are you no longer in the videos? That was the best part! Hope you make a comeback soon. I just cooked my first meal from scratch and it only took 46 years and a change in my diet. This recipe was super easy and so delicious! Thanks for making my transition to Vegan so appetizing and appealing! I made this dish today and it was pure heaven! I will make it again! So happy I have discovered you. Made 2 meals this week and they are just so absolutely tasty and easy. thank you…looking forward to when you print a book!! I am allergic to tomatoes. What do you suggest as a substitute for the ketchup? You can replace it by 1/2 tsp of rice vinegar! Just a FYI – to get some of the water out of the tofu you may want to press it for a few hours before by putting it on a plate – cover with another plate and then put something heavy on top – it will get out the excess water and make it more crispy. I made this tonight and it was fantastic! I’m going to make it again this week to share with my sisters! OMG! Seriously delicious! Better than the meat version! I haven’t eaten meat in 5 years! This was awesome! Just loooove your recipes!!!! I would like to know if you have, or may point me out, to a good vegan croissants recipe? I don’t but I’ll be working on it! Do you have to use fresh ginger or could you get away with powdered ginger from the spice aisle? I just don’t know what I’d do with so much Ginger if I bought it fresh. I did buy fresh ginger and made the recipe tonight. It turned out great and was delicious. Thank you! Next up, your recipe for tofu with peanut sauce. Every recipe I make of yours just turns out delicious!! Thank you for making simple, quick and yummy vegan recipes ! Had this tonight. Absolutely wonderful. We added some fresg pieaplle and cashews…plus a tbsp peanut butter. The dauce was beautiful as it was but we fancied a few wee additions. I did not have vegetable broth so i used some tomato soup and water. It came out perfect. My question is, how do I get the cornstarch to stick to the tofu better ?